Gateway Communications and Altobridges’ combined remote community satellite solution, African Cell Direct/Altobridge lite-site™, has been named best ‘Wholesale Service Innovation’ at this year’s Global Telecoms Business Innovation Awards. The Awards are designed to honor innovative projects involving telecoms operators and service providers around the world working in association with their vendors and suppliers. 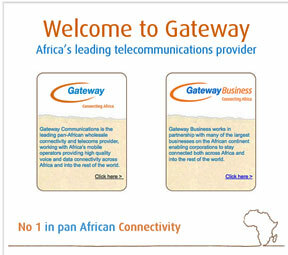 Gateway Communications, one of the largest providers of carrier solutions in Africa and Altobridge, a leading supplier of 2G/3G solutions for remote communities, recently entered into a joint initiative offering mobile network operators across Africa the delivery of cost-effective, green-powered remote community mobile communications. The Altobridge lite-site™ is a satellite-backhauled, solar-powered voice and data solution, while Gateway Communications’ CellDirect uses Demand Assigned Multiple Access (DAMA) technology to allocate satellite capacity based on time, frequency and availability. Benefits of the collaboration include reduced total cost of ownership for mobile network operators, minimum satellite bandwidth usage and cost, macro quality voice and data services, shorter ROI periods and immediate widespread service reach.